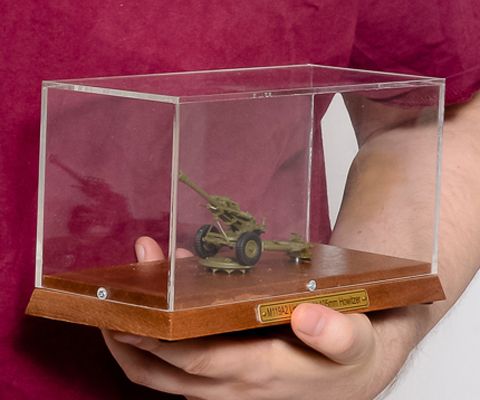 This highly detailed and accurate replica of M119A2 Lightweight 105mm Howitzer is 100% Pewter cast, manually assembled, painted and ready for display. The replica is mounted on a mahogany base with brass nameplate and a clear protective cover (display box). A perfect gift/award for exceptional service. Military & Defense Industry Personnel Only! 1. Send us email to contact@lifeinscale.net Do not forget to replace words "Your Name" in the subject line with your name - it helps us to keep better records of the sales. In your email confirm which replica/s you wish to buy and how many. Please, include your shipping address. 2. We will review it, verify the shipping cost and confirm your total including the shipping cost. 3. Upon receiving our email with the total, please, pay it in full via PayPal. Usually we have replicas in stock and will mail the replica/s as soon as we will receive your payment. If we do not currently have the required replica in stock, we will notify you.